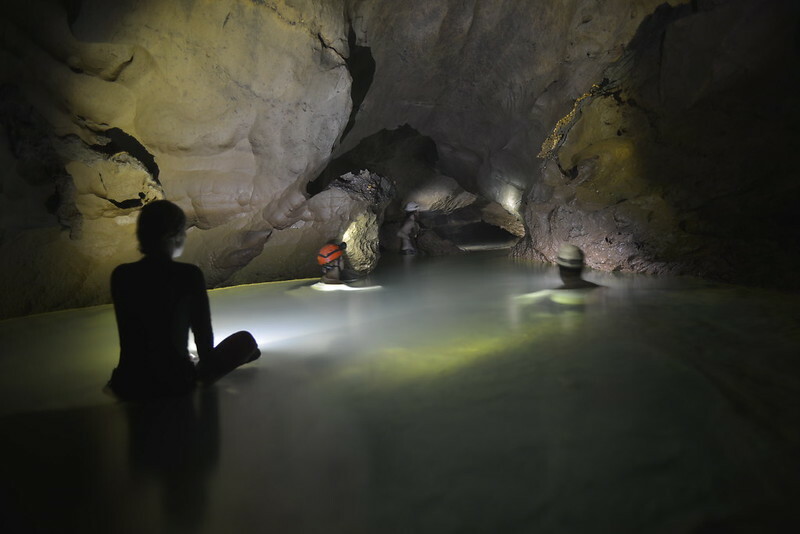 From the 12th to the 24th of February this year, I went on my first caving expedition, in Serra da Bodoquena, a great karstic landscape in Brazil. As a fresh caver, I was so poorly equipped it's still funny: I dressed up with my biologist clothing -pocketed vest, long-sleeved cotton t shirt and running shoes, not to mention my invertebrate-collecting tools, all ready to drop out of my pockets- and was heavily made fun of from my fellow experienced cavers (all part of being a newbie, I guess). The purpose of the expedition was to collect biologic material for study. First day, first cave: a simple cave, named after a Brazilian saint, with my first squeezer and first closed, tight saloon. What a thrill! The amazing ornaments, the quiet, the exercise, and living and seeing for myself how water actually 'behaves' underground, was determining for me. Around the third day, we went to the most amazing cave I've yet seen (in my almost-year as a yet-to-be caver). It had a huge, clean hall, and several dunes throughout it, after the great hall, we climbed down some 20 meters into a medium sized river (around 5-6m in width), with the crystal-clear running water, a very strong current that led to a huge pit (never explored, so far as I know). The fishes amazed me. There were about three to four species of fish, two of them troglomorphic - my first sighting of a troglomorphic vertebrate in the field- and other two unknown, as we were unable to collect. We swam upstream (which was surprisingly hard for me - a lab worker with an admitted sedentary way of life) only to find a rocky beach and endless tunnels leading everywhere. I sat on the beach, and started looking up, when I saw many troglomorphic spiders and harvestmen -finally, a use for my biologist skills!-. Further on, we were almost reaching the second great hall when one of my fellow newbies asked for us to get back, and he couldn't go upstream anymore (at this point, the ceiling was about 1,50m high and the water was at knee-height). We headed back, and by the time we got to the first great hall, we collected a few more invertebrates, took a few pictures and got out. After a lot of physical tests and perseverance (the mountains almost got the best of me), I got back, only to realize a few weeks later that caving was something I couldn't just do once (specially after all the tales I listened from experienced cavers), and I had to get in shape -and quit smoking-, equip myself (just a helmet so far, soon a overall) -which is not so easy for a grad student- and aim to go back to Serra da Bodoquena every time I had the chance, and so I did. I've been to 3 expeditions ever since, and the more I go, the further I go, and the best I explore. I've helped cataloging only 3 caves so far, and there are around 30 others waiting for our next expeditions. I've become so interested in troglofile species, that cave invertebrates is all I've been studying for a while now. All I can hope for is to become a real bioespeleologist and somehow manage to make a living from it. Caving got me healthy, it got me happy and became my main field of research.